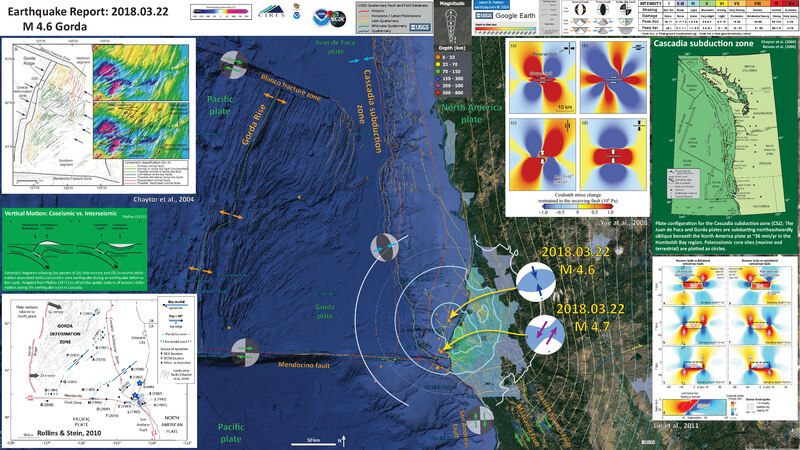 I was at a workshop to develop a unified strategy for research and monitoring in the Klamath River estuary (led by the Yurok Tribe, Andreas Krauss) yesterday and missed feeling the first of two M 4.6-4.7 earthquakes. I was presenting the results from our tectonic geodetic studies as they moderate Sea Level Rise at the mouth of the Klamath River (and control sedimentation there). However, I was home in Manila, CA when the second earthquake hit. I felt a sharp and short motion (1-2 seconds max in duration). But I was exhausted still from the death of my cat Chicken. So, I needed to wait until today to put this report together. 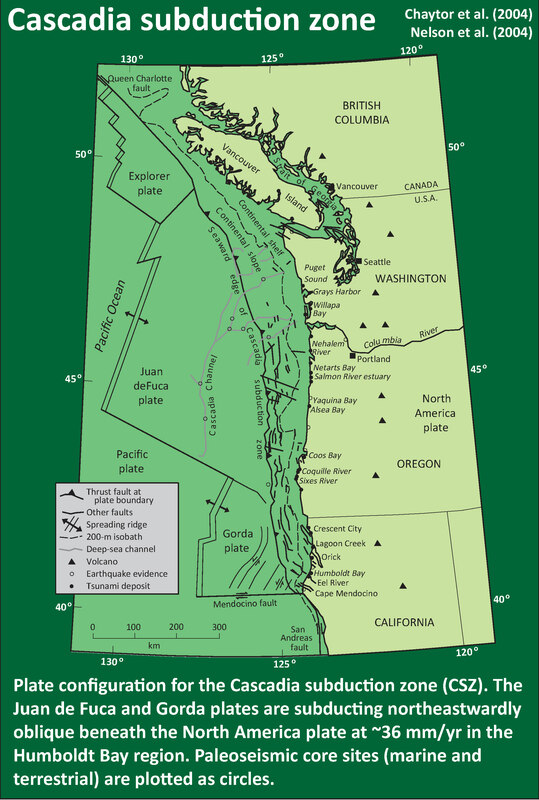 The Cascadia subduction zone (CSZ) is a convergent plate boundary fault formed by the interaction between the downgoing oceanic Gorda plate (GP) beneath the continental North America plate (NAP). More about the CSZ can be found here. 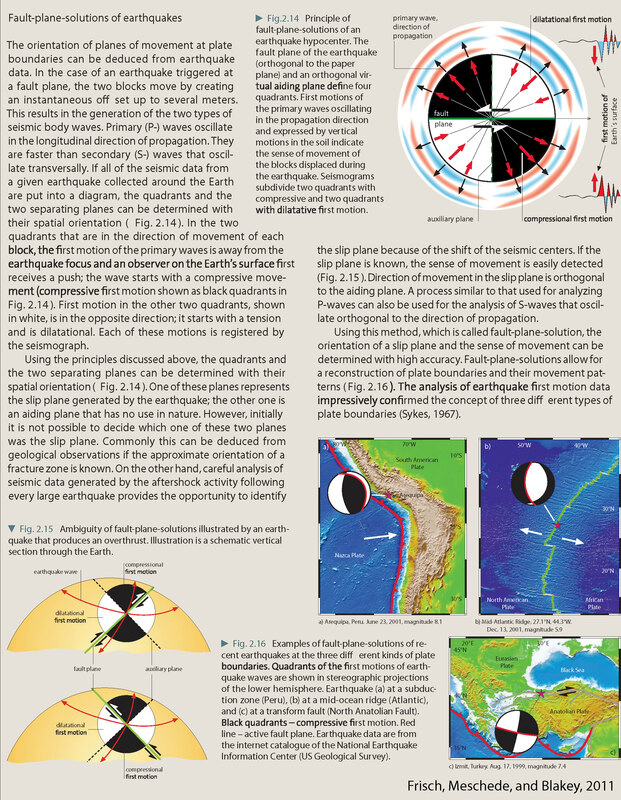 The first M 4.6 was a thrust earthquake within the Gorda plate. 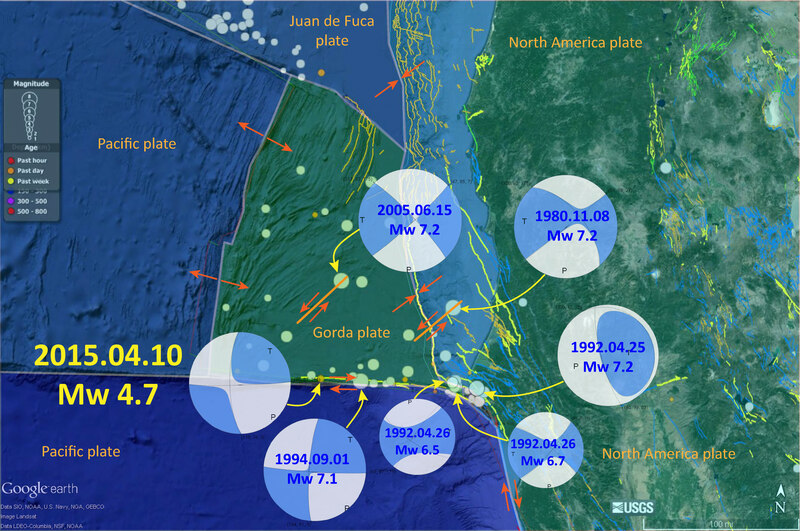 The CSZ megathrust fault slab depth is about 15 km at the location of these 2 earthquakes. The M 4.7 earthquake is a strike-slip earthquake. Because of the predominant northeast striking left-lateral faults in the GP, I interpret this earthquake to be left-lateral. My initial thought was that these two EQs could be related. So, I rummaged the literature to find papers that present research of static coulomb stress changes between earthquakes and faults similar to what we had yesterday. When an earthquake fault slips during an earthquake, the crust deforms elastically. This causes some regions to extend and other regions to compress. These extension/compression changes cause static stresses on faults to change. As the seismic waves travel through the crust, this can cause dynamic changes in stress along faults. Both of these types of stress change (static and dynamic) are very small. If there is a fault that is oriented correctly, has a high stress state (almost ready to slip during an earthquake), and has a sufficiently large enough stress change, the first earthquake may trigger a second earthquake. Because the second earthquake happened long after the main seismic waves had stopped traveling through the region, the M 4.7 earthquake could not have been dynamically triggered by the earlier M 4.6 earthquake. However, based on my review of the literature, it appears that the M 4.6 may have triggered the M 4.7 earthquake. I plot the seismicity from the past month, with color representing depth and diameter representing magnitude (see legend). I include earthquake epicenters from 1918-2018 with magnitudes M ≥ 4.5 (and down to M ≥ 4.5 in a second poster). I plot the USGS fault plane solutions (moment tensors in blue and focal mechanisms in orange) for the M 4.6 & 4.7 earthquakes. I include generic fault plane solutions for the other fault systems in the region. I include posters that show either M 4.6 or M 4.7 MMI and Did You Feel It data. I also have version that include emag2 magnetic anomaly data. These mag anomaly data nicely show the structure of the oceanic crust formed at the Gorda spreading center (the anomalies are initially parallel to the spreading center; that these anomalies are parallel to the spreading center was some key evidence for the plate tectonic hypothesis prior to it being accepted as a theory). I include the slab contours plotted (McCrory et al., 2012), which are contours that represent the depth to the subduction zone fault. These are mostly based upon seismicity. The depths of the earthquakes have considerable error and do not all occur along the subduction zone faults, so these slab contours are simply the best estimate for the location of the fault. In the lower left corner is a figure from Rollins and Stein (2010). In their paper they discuss how static coulomb stress changes from earthquakes may impart (or remove) stress from adjacent crust/faults. I place a blues star in the general location of today’s earthquakes. To the left of the CSZ map is a figure from Yue et al. (2008) that shows the results of their static coulomb modeling. They model static changes in stress change from source earthquakes (strike-slip in upper panel and thrust faults in lower panel) imparted onto receiver faults. 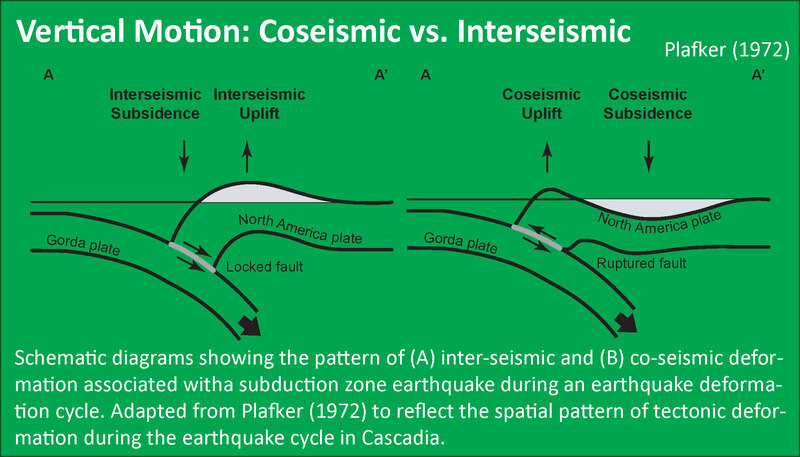 The lower left example (c) shows the stress change imparted following a thrust fault source earthquake imparted onto a left-lateral strike-slip receiver fault. If we rotate this panel counterclockwise (about 25°)to match the orientation of the M 4.6 earthquake, we may observe that the M 4.7 earthquake resides in the quadrant that saw an increase in static coulomb stress (colored red). In the lower right corner is another example of static coulomb stress modeling from Lin et al. (2011). 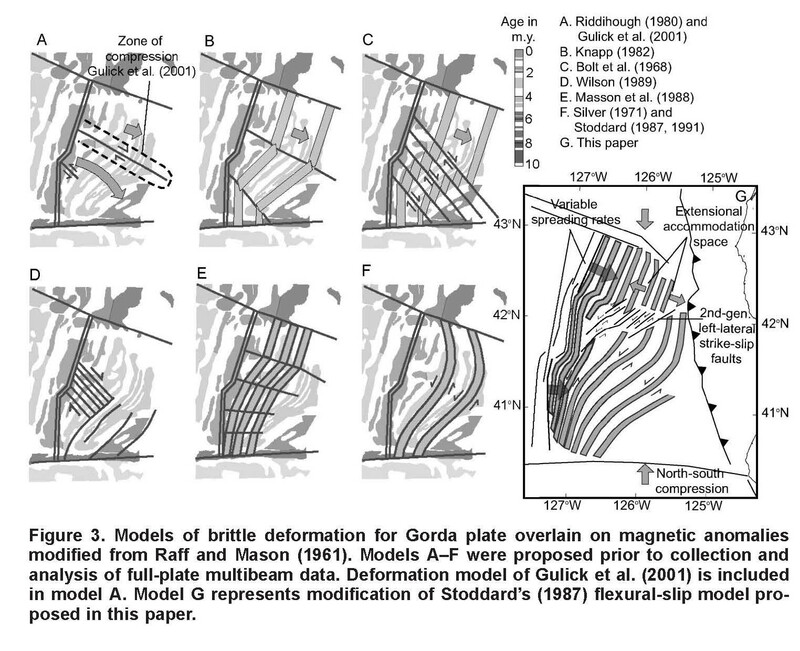 The left panel shows what static stress changes may be imparted from a source thrust fault onto left lateral strike-slip faults (“tear” faults are strike-slip faults that connect thrust faults). These left panels also show an increase in static coulomb stress in the lower left quadrant. I take these two examples as supporting evidence for my hypothesis that the M 4.6 earthquake triggered the M 4.7 earthquake. 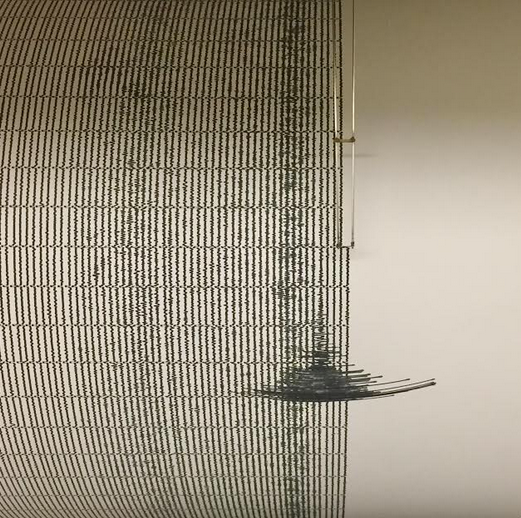 Here is the Baby Benioff Seismograph from Humboldt State Univ. Dept. of Geology. See social media below. I later noticed that there was a M 4.5 earlier on 2018.03.09 south of these two M 4.6 and 4.7 earthquakes. I here prepare an overlay analysis of the seismicity with the Yue et al. 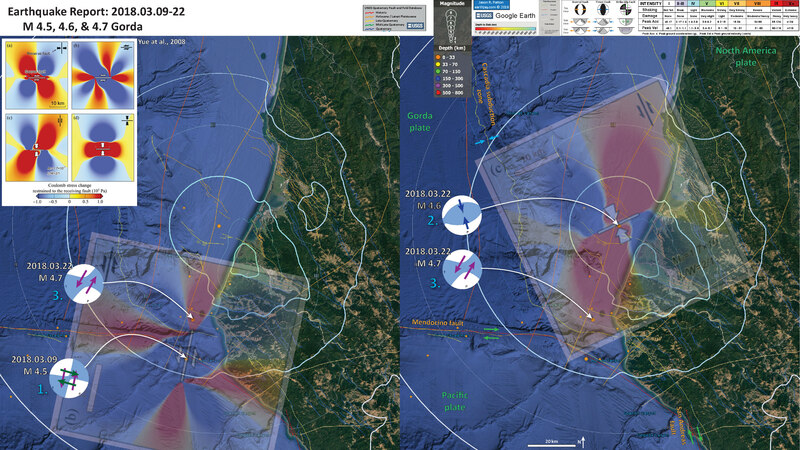 (2008) results compared to these 3 earthquakes in a sequence. The below figure has two panels representing the hypothetical static coulomb stress changes between these three earthquakes. Earthquake order number is labeled in cyan. I orient the Yue et al. (2008) figures relative to the primary nodal plane strike preferred USGS interpretation. In other words, I use the orientation of the USGS preferred fault plane solution to orient the Yue et al. (2008) coulomb stress change figures. These overlays are scaled relative to the published scale. Note how the largest magnitude (M 4.7) earthquake is in a region of increased static coulomb stress from both the prior earthquakes. These stress changes are very small and the magnitudes are probably not scaled appropriately for the space, so this is possibly a conjectural interpretation. The left panel shows what stress changes might happen on left-lateral strike-slip receiver faults given a left-lateral strike-slip source fault. The M 4.7 EQ is in the region of increased static coulomb stress. The right panel shows what stress changes might happen on left-lateral striek-slip receiver faults given a thrust fault source earthquake. The M 4.7 EQ is AGAIN in the region of increased static coulomb stress. Here is the Yue et al. (2008) figure, along with their figure caption below. Coulomb stress change for different combination of faults. The thick while line marks the source fault, and the white arrows indicate the focal mechanism. The black line and the black arrows represent the orientation of the receiving fault and its mechanism, respectively. Here is the figure from Lin et al. (2011), along with their figure caption. Maps showing Coulomb stress changes caused by an M = 7.0 earthquake on adjacent tear faults. The source is the same as in Figure 4. Coulomb stresses are calculated on (a–c) left‐lateral and (e–g) right‐lateral tear faults. Stress is sampled at depth of 1 km (Figures 6a and 6e), 10 km (Figures 6b and 6f), and 19.5 km (Figures 6c and 6g). (d) Cross section at the right end of the source earthquake (cross section position shown in Figure 6a). 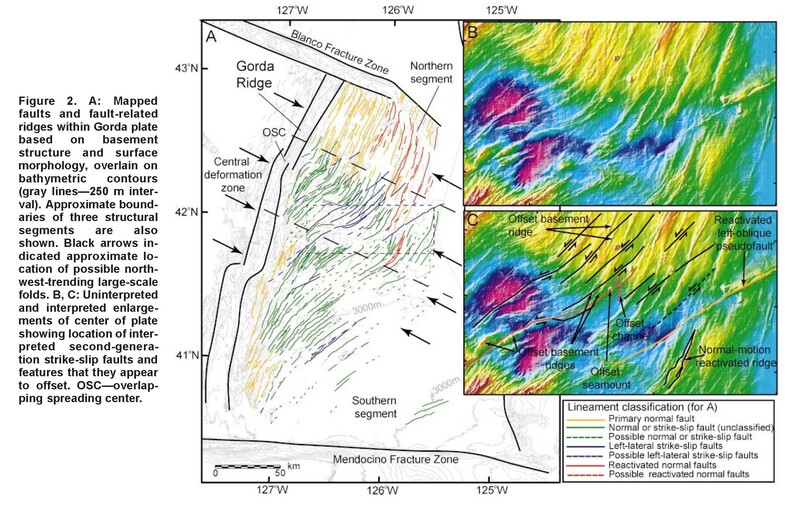 Note that left‐lateral tear faulting is favored in one position with respect to the thrust, while right‐lateral faulting is favored in the opposite position. 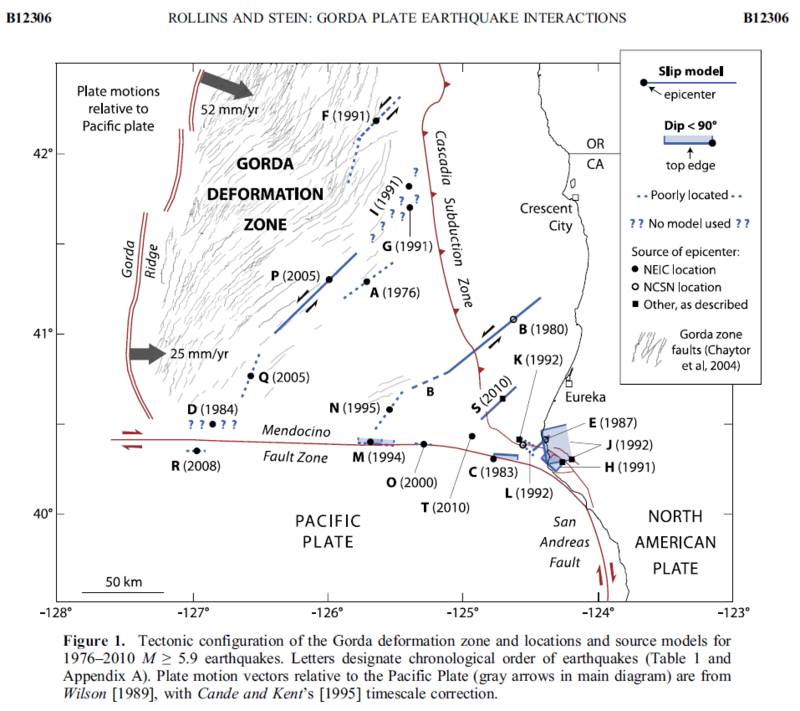 2 Responses to Earthquake Report: Gorda plate! Jay, so sorry to read about Chicken. So painful to lose a good friend. Thanks for this site, though. Much of it is beyond my level of understanding at this point, but it’s still fascinating. Please pardon me for being presumptuous, but as soon as you are ready, consider getting another cat. I’ve been told “they come back to us,” but whether that is true or not, they leave a feline-shaped hole that only another cat can fill. Take good care.